Old State Rd is a road close to where we live that is supposed to be haunted, upon learning this we decided to investigate all the myths. Like if you park your car on the tracks you get pushed off and there will be small hand prints on the back of your car because some bus full of kids got hit there back in the 70's, or if you park on the bridge and turn your car off a "lady in white" will appear and chase you down and your car won't turn back on, and if you go under the bridge you can find the noose the lady hung herself on. Well we have disproved everyone of these, the railroad is on some odd hill thing, the "lady" is a sign, and the noose is loose cable thats hanging from the bridge. However, we have found things of our own, the bridge was the sight of a civil war battle. While Sherman marched towards Columbia, and the confederates made a last stand against them, the union soldiers flanked the confederates by crossing the creek in the night. We've heard people walking and falling in the creek, and have even seen union soldiers and lanterns. The railroad is odd as well but we just don't know why. We've had some experiences there, and so on this trip decided to take some pics. In this picture, well first off it was taken by our friend, with our other friend next to him. In the pic you can see me in the orange, my girlfriend next to me, and our other friend was standing to the left of her, barely visible. (If you look closely on the left side you can see his gut poking in frame slightly). But to the left of me in the picture you can slightly see what looks like somebody standing facing the camera. Upon further and closer investigation we noticed this "person" appears to be my friend who is barely in the pic on the left, and that he's facing the camera, and also waving. First thought was that it was somehow a reflection within the picture as I've had that problem with pictures taken there before, but that's always symmetrical with the object it's reflecting, where here it is not. Also our friends facing towards the right in this picture while this person is towards the camera, so I don't think that is it. I'm not sure if this is some supernatural being mimicking the appearance of my friend and waving towards us, or some odd camera trick, and I just need some help finding out please. Thank you for your submission. I approved your submission based on the fact that you provided so much detail in your description. That was great. I believe you are seeing something in your photo, but by the time it is uploaded to the site, something is lost in the translation. Could you please provide another version, but this time enhance it a bit so we can see better what you are looking at? Perhaps work with the contrast or lightness/brightness to get it to show up better. I'll post them together so we can all see the difference and give you opinions. I'm afraid the way it is, all you'll get is, "I can't see it." 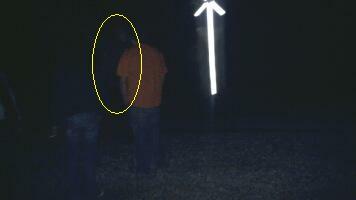 Thanks Chris, and title your new submission Old State Road Ghost Pic #2 so I know what it is.